Wednesday night, come home late, fridge is empty. I don’t know what the temperature was that night but it felt like 40°C – it was hot enough for me to go down to the shops later in the night and buy icy-poles! A salad would have been perfect for dinner, but I had that for lunch, and I needed something filling, easy, quick. 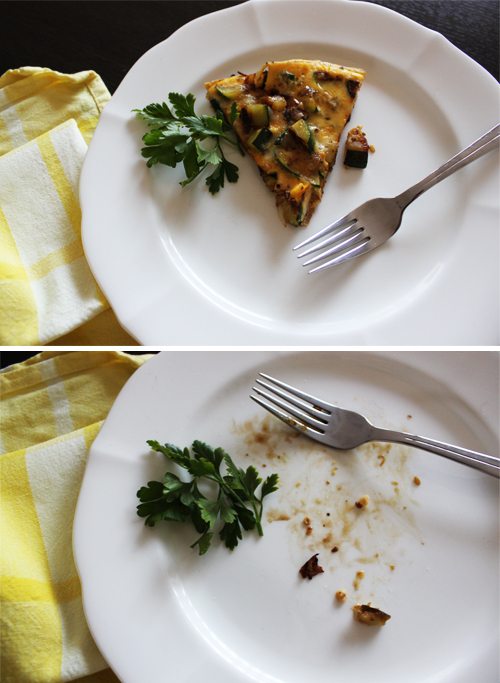 Enter zucchini frittata. I had a zucchini, I had eggs. This is one of those dishes that bring back memories – Sunday lunch with the family, there’s the frittata, cold meats, sliced tomatoes drizzled with oil, salt and oregano, and some crusty bread. If you have these items I suggest eating them for lunch one day because it truly is a simple Italian lunch that is easy and delicious. Cooking a slice red capsicum with the zucchini. Sauté a sliced red onion before cooking the zucchini. When you're ready to pour the egg mixture over, scatter the red onion over the zucchini first. Add a handful of grated parmesan in the egg mixture – this will create a greater depth of flavour. Add a good splash of olive oil in a hot pan, and start sautéing the onion and garlic. When the onions becomes slightly translucent, add the zucchini. The zucchini will take around 10-15 minutes to cook. Move the zucchini around when one side becomes golden. 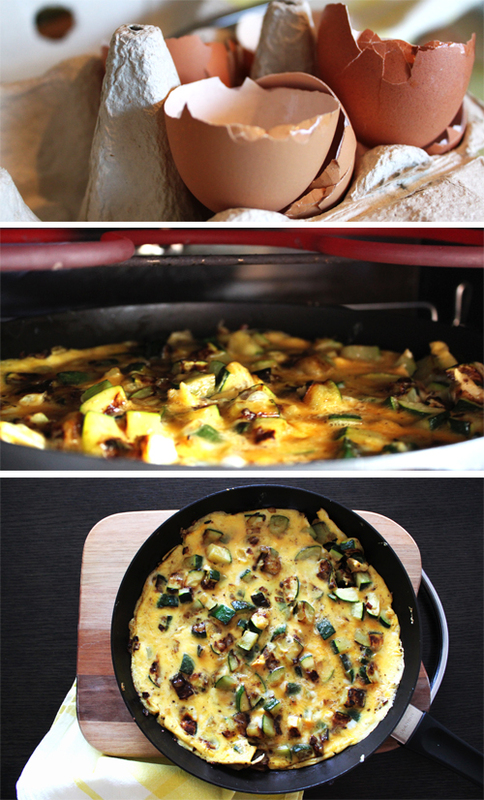 When the zucchini is completely golden, spread them evenly in the pan and pour the egg mixture over the top. Turn the heat down, you don't want the eggs to cook too quickly and dry out. When you find pockets of runny egg mixture, use a spatula to move the base of that section, which will allow the egg to run to the base of the pan. When the base of the frittata is set, place the pan under a grill to finish cooking the top. Finish off with a drizzle of olive oil and a pinch of salt.